3-1 Do the 2007 Cabinet decisions say that there is no proof of coercion? There are nine 2007 Cabinet decisions concerning the comfort women issue, all official written replies to an appeal submitted by House of Representatives member Kiyomi Tsujimoto (one resolution on March 16, two on April 20, three on June 5, one each on July 6, August 15 and November 9. See: http://www.shugiin.go.jp/index.nsf/html/index_shitsumon.htm Japanese only). 1) The Kono Statement took a comprehensive approach when it determined coercion had been used, not restricting itself merely to written documentation, but also taking into account testimonies of the victims and of military personnel, as well as official U.S. documents and field research carried out in Okinawa. And Reply no.110 cannot refute the Kono Statement. Thus the 2007 cabinet decisions have not refuted the Kono Statement. B) All nine Cabinet decisions made in 2007 are understood to have been made as a continuation of the Kono Statement. 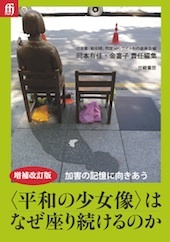 Hence Osaka Mayor Toru Hashimoto is in error when he asserts a choice between one or the other. The latter follows on the former. Hashimoto’s intention to negate the whole comfort women issue by citing lack of documentation is factually bankrupt. In addition to the oral testimony of the victims, there is substantial documentary evidence of their having been taken away by force. Among other places, such documentation appeared at the B and C class war criminal trials and at the International Military Tribunal for the Far East. War veterans have also testified to the fact. Moreover, it is important to remember that trials conducted in Japan have officially confirmed the truth, including the fact of violent coercion by which the women suffered harm. There have been ten suits, started by Korean (including ethnically Korean Japanese), Filipino, Chinese, Taiwanese and Dutch victims. The court rejected claims of compensation, but recognized the facts themselves (in eight cases out of ten): abductions and forcible removal close to abduction “captured with hands and feet bound”, “compelled in spite of refusal” for thirty-one persons (six Korean, twenty-four Chinese, one Dutch), and “fraud using flattery” for four (all Korean). The court said there was “irrefutable historical evidence” for their stories. (Shiho ga ninteishita nihongun ianfu [The comfort women of the Japanese military as acknowledged by Japanese courts], Tsubokawa Hiroko and Omori Noriko, Publ. 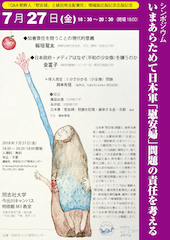 Kamogawa Booklet 2011) On top of the Kono Statement, we have to take quite seriously the fact that the truth of these women’s suffering was reconfirmed by the Japanese courts.